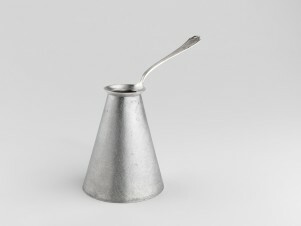 Silver spoon stem with the bowl removed, and a deeper pewter body attached to form a free-standing piece. Spoon bought on eBay in the UK or USA. Bowl of the spoon removed using a piercing saw, retaining the edge of the bowl and handle. Pewter forms made using simple forming techniques around steel formers (wooden and rubber mallets used). Soldered together with tin solder and plumber's flux. 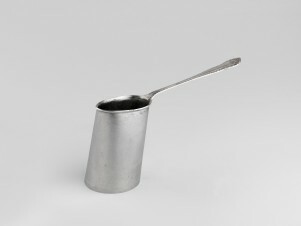 Tilted: Silver Plate Spoon and Pewter (from 'Spoonie Collection'), David Clarke, 2011, Crafts Council Collection: M89. Photo: Todd-White Art Photography. Spoonie Collection, David Clarke, 2011, Crafts Council Collection: M89, M90, M91. Photo: Todd-White Art Photography. David Clarke is often cited as one of Britain's most highly innovative silversmiths. Since graduating from the Royal College of Art in 1997, Clarke has produced a wealth of covetable objects that have proven pivotal in the renaissance of contemporary British silversmithing. Clarke has a well-earned reputation for producing engaging, intelligent and challenging domestic objects. The aesthetic most often associated with Clarke's work relates to the subversive nature in which he responds to the entrenched traditions of silversmithing, often taking it to surprising extremes. This absolute willingness to experiment and play inappropriately sets Clarke apart.